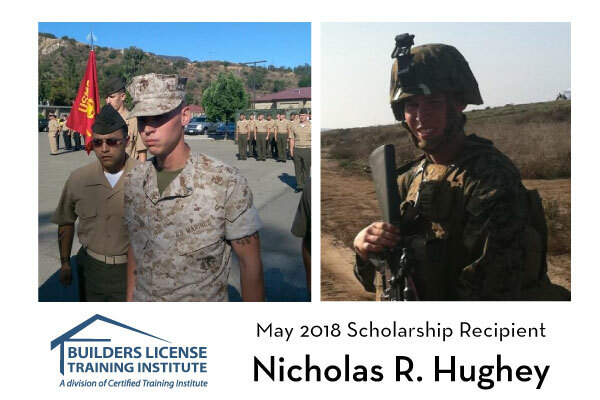 Congratulations US Marine Corps Veteran Scholarship Recipient, Nicholas R. Hughey! Nicholas R. Hughey from Portage, Michigan is Builders License Training Institutes May 2018 scholarship recipient. Nick, a United States Marine Corps Veteran served four years and received many awards and decorations, including a Navy and Marine Corps Good Conduct Medal, National Defense Service Medal, Global War on Terrorism Service Medal, Overseas Deployment Ribbon and a Letter of Appreciation - Okinawa Beach Cleanup 2013. Nick grew up in Michigan's upper peninsula. After his time in the military, Nick spent a summer working in the building trades but decided to return to school in pursuit of a business degree. He immediately missed the trades and realized his true calling. He wants to become an M&A Contractor and pursue his dream of owning a business in Southwest Michigan. Congratulations Nick, we're proud to offer you this opportunity to build a better tomorrow! This entry was posted in All Industries, Construction and tagged Veteran Scholarship.